The courthouse at Bishop Street, Derry. A man who was told not to drive two weeks before he caused what were called “catastrophic” and “life changing” injuries to a woman in a crash, has appeared before Londonderry Crown Court. Declan Murray (44), of Main Street, Strabane, pleaded guilty to causing grievous bodily injury by dangerous driving on November 29, 2012. The Crown Court was told the injured party sustained numerous fractures to her legs and ribs as a result of the crash and was in hospital for six months. Two children who were under her care also sustained injuries. 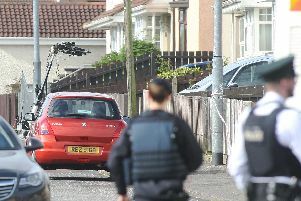 The court was told Murray was driving his white transit van on the Victoria Road, in the direction of Magheramason, while the injured party was travelling in the direction of Londonderry when Murray’s van crossed the white line and collided with her car. The court was told it was a head on collision and substantial damage was caused to both vehicles. One of the witnesses at the scene was a nurse who gave first aid to the injured party until paramedics arrived. The injured party was trapped in her vehicle and had sustained substantial injuries to her lower limbs. She was unconscious and unresponsive and at one point there was a genuine fear for her life. The court heard how the woman spent six weeks in Intensive Care and was in hospital for a total of six months. The Judge, Philip Babington, was told she still had ongoing problems, which included difficulty walking. The court was told the injured party is a child minder and she had two children in the back of the car aged five and eight-years-old. One of them sustained a cut which required four stitches and the other had injuries to the abdomen. Murray was in a confused state after the accident and said he may have had a seizure. He sustained an injury to his sternum. The prosecution told the court the victim, who was present for the hearing, wanted justice not vengeance. Murray was not interviewed by police until February, 2014. He admitted he had been diagnosed with epilepsy prior to the crash and had been told not to drive. Defence counsel Steven Mooney said Murray was “saddled with remorse” and this case had eaten away at him for years. Mr Mooney said his client “had been advised by a professional not to drive, but and he ignored that advice”. He said Murray wished to “express his absolute and complete remorse to the injured party”. “The accident was entirely his fault and he hopes that she gets on the road to recovery and the effects are not as grave as they have been,” he said. Judge Philip Babington adjourned sentencing and Murray was remanded in custody.